These settings affect only the selected Chart widget. To update the default settings with these value for newly-opened Chart widgets, or to apply them to existing opened widgets, click Defaults. Right-click in the widget to open the context menu and select Settings. Chart Type Select the type of chart to display. Interval Select the time interval that the chart displays market data. Show tabs Whether to enable tabs in the widget. Colors Define colors for chart elements. These settings let you customize the colors for different aspects of the selected Chart Type. 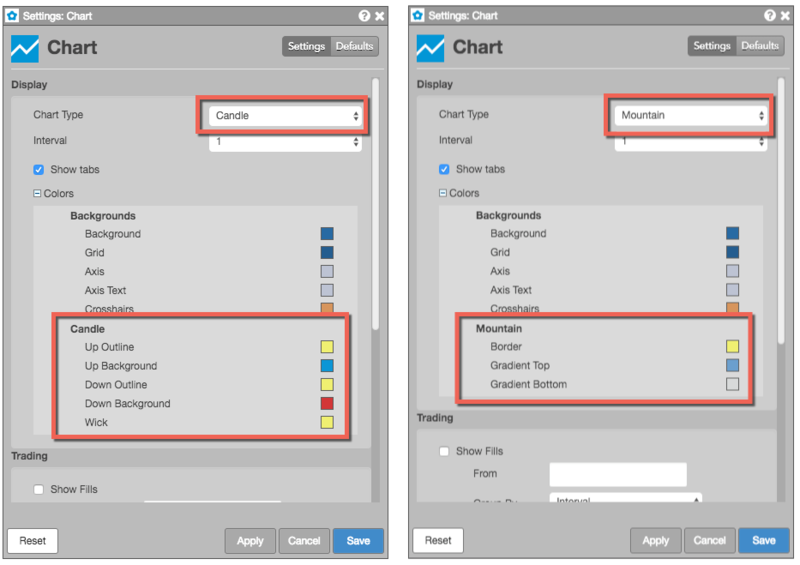 For example, a Candle chart includes color settings for Candle Up and Candle Down, while a Mountain chart includes settings for Border and Gradient Top. Show Fills Sets whether to display fills on a chart. Group by: Whether to group the fills by Interval or Position. For more information, see Displaying fills. Include Leg Fills Sets whether to show leg fills in addition to parent order fills. Show Working Orders Sets whether to display working orders on a chart. 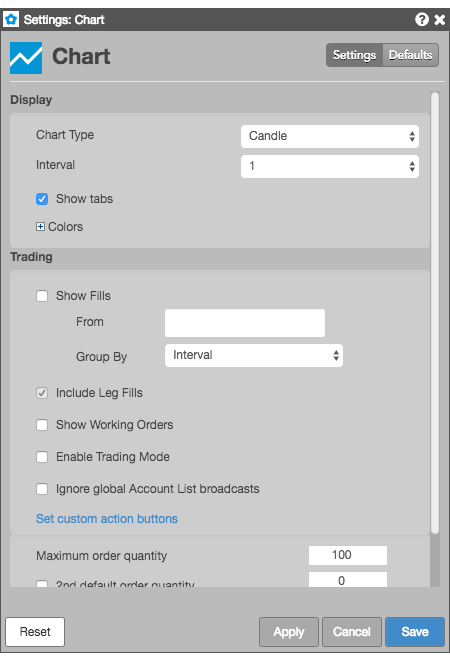 Enable Trading Mode Sets whether to display MD Trader in the chart for trading. Ignore global Account List broadcasts Configures the widget to ignore account selections made in an Account List. When checked (enabled), the widget ignores account selections broadcast by an Account List widget. Set custom action buttons These settings allow you to add or removed custom buttons on the Chart widget for commonly used order types and time-in-force (TIF) order settings. For more information, see Adding an order button to a chart. Maximum order quantity Sets the maximum quantity allowed per order. 2nd default order quantity Provides the ability to right-click in the Bids and Asks column at a price level to submit an order with a different default order quantity. To enable this feature, you must check the checkbox and type a quantity in the box to the right of this option. Stop Limit payup (ticks) Sets the maximum number of ticks away from the Stop trigger price to enter the Limit order. For more information about these settings, refer to Interpreting the Price Distribution chart.